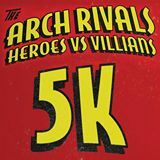 "A Superheroes vs Villiains family friendly 5K fun run in Downtown Reno." Dress as a superhero or villain, do the race, and get a cup for the Superhero Crawl that night. But maybe wash your sweaty costume before you go back out in it... More info at their Facebook page.